The 2009 Afrikaanse Woordelys en Spelreëls (AWS) is a publication commissioned by the Suid-Afrikaanse Akademie vir Wetenskap en Kuns and the Pan-South African Language Board and is an authoritative and comprehensive reference work for which there is, ultimately, no substitute. However, unfortunately many thousands of people who need to, or want to, understand Afrikaans spelling rules and writing conventions are non-mother-tongue speakers for whom the AWS is almost literally a closed book, and the need for a publication aimed at making the AWS more accessible to such people became increasingly obvious to me. 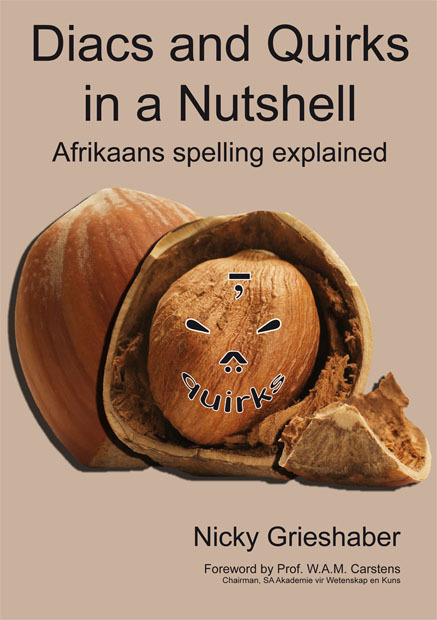 I wrote Diacs and Quirks in a Nutshell – Afrikaans spelling explained to meet that need. In it I explain all the main rules and conventions clearly and with many examples. Throughout the book the reader is referred to the AWS for further details and examples, should he or she find those necessary. Three self-tests, with detailed answers, are included in the book, while the annexures and endnotes contain a wealth of important and useful information. A great plus is that the book is also available in three different e-formats. 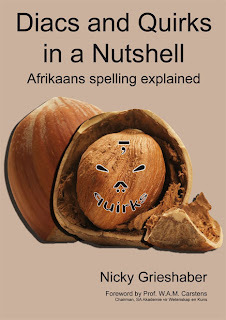 Further information, including the table of contents and the foreword (by Prof. Wannie Carstens, chairperson of the SA Akademie vir Wetenskap en Kuns) can be found at http://afrikaans-spelling.blogspot.com. Details for ordering your own copy directly from me are available on my website.